Could we please have a moment for Jilly's latest obsession? She has seriously taken to ruffling fabric. To date she has added a touch of ruffling to pillows, slip covers, ribbons, bed skirts, table runners, window treatments, and hair accessories. Please don't be alarmed if you see her Christmas card in the mail featuring her whole family in ruffled cardigans. I think she might be working on ruffled, winter scarves for the geese in her back yard. I don't like to judge, so I just loving encourage her to take a moment now and then to feed her family and bathe the children between ruffling. Now on to our current find.....this little crystal lamp was sitting so lonely on a shelf at Savers with a $7 price tag and we knew right away, it had some serious potential. Jilly got to work ruffling a scrap of muslin fabric from some old curtain panels. She whipped up this shade in a snap and we added a fancy flower embellishment to finish it off. 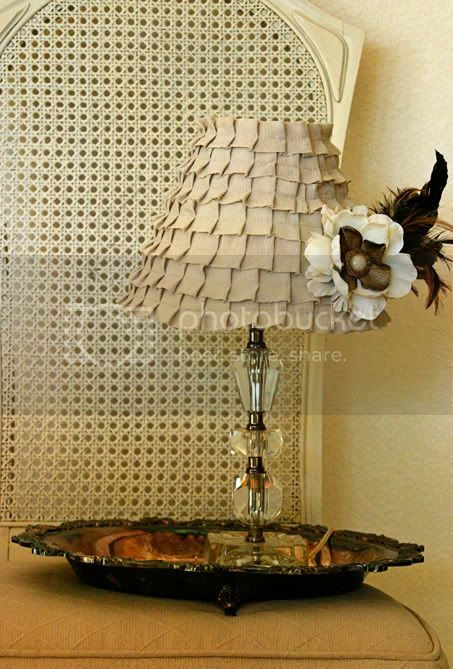 Do you have a not so awesome lamp you've transformed into a work of art? Send us pics and all the info to mindapacheco@msn.com and we'll feature you in an upcoming post! And yes, in honor of Jilly, we're going to do a DIY ruffle tutorial very soon. PLEASE tell me how you made this!!! I have several lampshades that DISGUST me and I've searched high and low for the perfect DIY because lampshades these days are exhorbitantly overpriced. I absolutely love this shade and I am anxiously awaiting this tutorial. Please feel free to post it as soon as you want!!! Looking forward to your DIY tutorial on the ruffles. Thanks for the great blog ladies!! LOVE IT! I love ruffles too...I have 3 boys and I can't dress them in ruffles, so I decorate with and wear a lot of ruffles. Oh I love Savers too.